CBS introduced legal drama The Storefront Lawyers in September 1970, part of the wave of relevancy that swept the TV networks that fall. Revamped at mid-season as Men at Law, it ended due to low ratings after 23 episodes. There were two projects focusing on young people and the legal profession in development during the closing months of 1969 for the 1970-1971 season. Both were part of a push for relevancy during the 1970-1971 season. The networks wanted shows that were topical, contemporary, youthful and socially aware. “Now” was the word of the day. One was called The Storefront Lawyers, produced by National General Television Productions Inc. and Leonard Freeman Enterprises. Explaining the shift in focus, CBS-TV vice president in charge of program development Alan C. Wagner told Broadcasting “the days of pure nonsense are over.” Audiences expected and wanted to see shows that were “germane to the times” . Shows like The Interns, about a group of young doctors; The Mary Tyler Moore Show, about an independent, single woman making it on her own; and The Storefront Lawyers, about young lawyers offering free legal service to the underprivileged. CBS announced its official 1970-1971 schedule on February 19th, 1970 and The Storefront Lawyers had made the cut. It was given the 7:30-8:30PM time slot on Wednesdays, followed by The Beverly Hillbillies at 8:30PM, Medical Center at 9PM and Hawaii 5-0 at 10PM . David Karp created the series, which was executive produced by Leonard Freeman and produced by Harold Gast. Robert Foxworth starred as David Hansen, a young lawyer recently hired by the prestigious law firm of Horton, Troy, McNeil, Carroll and Clark in Century City, Los Angeles. Sheila Larkin and David Arkin co-starred as his fellow lawyers, Deborah Sullivan and Gabriel Kay, who worked at the same firm. The three also ran a free legal clinic out of a store in downtown Los Angeles called the Neighborhood Legal Services (NLS), which provided legal aid and advice to those who otherwise wouldn’t be able to afford it. Rounding out the cast was A Martinez, who appeared occasionally as the NLS law clerk, Roberto Alverez. Barry Morse guest starred in the pilot episode as Holly Chapman, a senior partner with Horton, Troy, McNeil, Carroll and Clark. In late July, the network shuffled its new fall schedule, moving six programs on three different nights . It was considered an unprecedented change to a The Storefront Lawyers would no longer be followed by The Beverly Hillbillies, which shifted to Tuesdays at 7:30PM. Instead, The Governor and J.J. would air from 8:30-9PM on Wednesdays. It was an attempt to provide better flow and stronger counter-programming. CBS promoted The Storefront Lawyers as “one of the most vital, most relevant series ever televised” . Reportedly, some of the scripts were based on actual legal cases. According to producer Harold Gast, “the idea is to get an exciting mix which will include social themes. We’ll explore the matter of integration in labor unions, black militancy, police raids, the problems of Mexican-Americans. And there will be a murder trial, the story of a woman with an insane husband, and another about a swindle” . Gast pushed back against comparisons to The Mod Squad, pointing out that unlike that series, The Storefront Lawyers wouldn’t feature an “older father-figure” . The series premiered on Wednesday, September 16th with an episode in which the lawyers defended an old man who shot and killed a wealthy financier in front of a crowd. Critics were split. The series, Norman Mark of the Chicago Daily News argued, “should be convicted of misrepresentation, overglamorization and fraud.” Likewise, wrote Ron Powers of the Chicago Sun-Times, “the writers are guilty of oversimplifying and distorting the intent of legal process.” And Terrence O’Flahety of The San Francisco Chronicle felt the premiere was “full of the sullenness that has somehow become associated with dedication” . Rick Du Brow of United Press International criticized the dialogue but praised the end of the episode. “Instead of just blindly attacking the establishment [the episode] illustrates the specifics of some of its rotten parts. This is not just provocative script writing but — even as an extreme case — intriguing social reporting” . And Dave Simms of The Palm Beach Post wrote “all the created tenseness and suspense in the premiere lacked one rather important ingredient — a semblance of reality” . One positive review came Jack Gould of The New York Times. He called the pilot “a professional hour of television” and argued the series “can do great good in using a mass medium to emphasize that the indigent should be entitled to expert legal advice” . Another came from Fred Wright of The St. Petersburg Independent, who praised the pilot’s storyline and cinematography, suggesting that “if such attention is continued, and if those hinted themes and characterizations hinted in the first episode are maintained — two vital ‘if’s’ — ‘Storefront Lawyers’ could well prove one of the best of the season” . Although CBS won premiere week in the Nielsen ratings, and even won Wednesday, The Storefront Lawyers did not do well, debuting outside the Top 40 for the week . Later episodes involved a construction worker accused of a racially-charged bombing after being replaced by a black man; Deborah defending a militant Mexican while dating the prosecuting attorney; an undercover operation to prove a training school had swindled an elderly woman; and Roberto being arrested while attempting to track down a migrant worker from Mexico. Guest stars included Kurt Russell, Joyce Van Patten, William Conrad and Anthony Zerbe. The network announced in mid-January that it was replacing The Storefront Lawyers with a new drama series called Men at Law . It would star Robert Foxworth and Gerald S. O’Loughlin, with Sheila Larkin and David Arkin in supporting roles. The 13th and last episode of The Storefront Lawyers aired on January 13th, 1971; Men at Law premiered several weeks later on February 3rd. O’Loughlin had guest-starred in a few episodes of The Storefront Lawyers, including the pilot episode, as a district attorney. In Men at Law he played Devlin Michael McNeil, a senior lawyer with Horton, Troy, McNeil, Carroll and Clark, who worked closely with David Hansen. Discussing the changes to the series, Foxworth explained “the focus is moving away from the storefront a bit. We’ll be getting into more straight sort of legal problems. We’ll still be dealing with some cause issues, but not to the same extent” . The debut episode of Men at Law saw Devlin and Hansen defending a college student accused of killing a police officer during a campus riot. Other episodes involved charges of psychiatry malpractice that led to suicide; a meek insurance salesman accused of murder after a witness identifies his voice; and Devlin agreeing to defend an old friend’s daughter caught up in an activist bombing whose boyfriend takes Deborah hostage. Guest stars on Men at Law included William Shatner, Cloris Leachman, William Windom, Tom Skerritt and Lee Grant. The changes to the series were not enough to save it from cancellation. The final first-run episode of Men at Law aired on April 14th. In it, Devlin and Hansen defended a soldier charged with mutiny after attacking a superior officer while trying to stop the murder of an anti-war protester. Reviewing the penultimate episode, Cynthia Lowry of The Associated Press wrote “the program seems to have improved considerably since the window-dress of the storefront was cut out. It has turned into a pleasant, sleek action series pegged on legal cases. Given a longer chance to build in its new form, it might have survived CBS’s program pruning” . 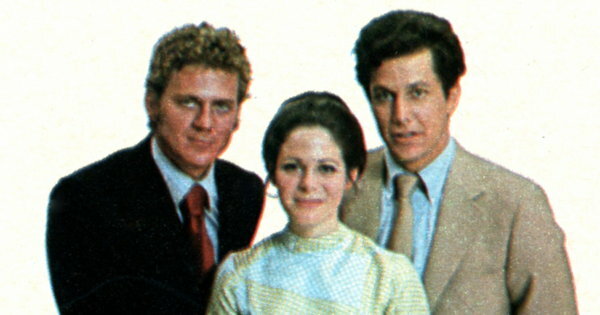 Repeats of both The Storefront Lawyers and Men at Law were broadcast throughout the summer of 1971, with the last repeat airing on Wednesday, September 1st. A total of 23 episodes of both versions — 13 for The Storefront Lawyers and ten for Men at Law — were produced over the course of the 1970-1971 season. The theme song to The Storefront Lawyers was composed by Mort Stevens and performed by The Ventures. A somewhat longer version was issued as a single by Liberty Records. A novelization of the pilot episode written by A.L. Conroy was published by Bantam Books in October 1970. 1“A search for relevance next season.” Broadcasting. 17 Nov. 1969: 55. 2 Ferretti, Fred. “TV Fall Programing Puts Accent on Reality.” New York Times. 20 Feb. 1970: 54. 3 “CBS juggles its line-up.” Broadcasting. 27 Jul. 1970: 55. 4 [Advertisement]. Broadcasting. 8 June. 1970: 37. 5 Lowry, Cynthia. “‘Storefront Lawyers’ Previews Sept. 16.” Gadsden Times [Gadsden, AL]. Associated Press. 21 Aug. 1970: 13. 7 “New season opens on faltering note.” Broadcasting. 21 Sep. 1970: 48-49. 8 Du Brow, Rick. “TV In Review.” Lodi News-Sentinel [Lodi, CA]. United Press International. 17 Sep. 1970: 10. 9 Simms, Dave. “Tense Illusion.” Palm Beach Post. [West Palm Beach, FL]. 17 Sep. 1970: D9. 10 Gould, Jack. “TV: Socially Involved ‘Storefront Lawyers’ Bows.” New York Times. 17 Sep. 1970: 94. 11 Wright, Fred. “New Lawyers Look Good.” St. Petersburg Independent [St. Petersburg, FL]. 16 Sep. 1970: 10-B. 12 “CBS beats NBC in premiere week.” Broadcasting. 5 Oct. 1970: 57. 13 “‘Strange’ is a comer in New York Nielsens.” Broadcasting. 18 Jan. 1971: 46. 14 Green, Tom. “Boyish Actor Talks of Changes.” The Evening News [Newburgh, NY]. Gannett News Service. 23 Jan. 1971: 7. 15 Lowry, Cynthia. “Royal Gala a ho-hum.” Geneva Times [Geneva, NY]. Associated Press. 8 Apr. 1971: 16. 1 From TV Guide, September 12, 1970, Page 48. Both The Storefront Lawyers and The Interns were carried on Canada on CBC. I have a copy of the 45 of Storefront Lawyers; it’s a catchy tune, but it failed to achieve the chart success of the Ventures’ version of Mort Stevens’ theme for Hawaii 5-0. Jack….Would you be interested in trading the episodes that you have? Justice for the “poor,” minorities, etc., make the “system” ‘fairer’ (in 1970–now celebrated as the heyday of “liberal” equalitarianism by Paul Krugman, et al., on the ‘Left’!). Wasn’t Pres. Obama supposed to do all of that–starting in 2009?WHY NOT a “Libertarians” TV Series? THE YOUNG LAWYERS, as said, was in fact about law school students…who were in fact able to take cases to trial. How was that possible? The show was set in Boston, and Massachusetts law allows lawyers in training to handle cases in court, under the supervision of an accredited attorney. That role was played by Lee J. Cobb. It’s available on DVD, and I would think it’s as much for the fact that one of the idealistic barristers to be was played by Zalman King–better known for being the man behind the Showtime series RED SHOE DIARIES.